Levitation is a phenomenon of psychokinesis (PK) in which objects, people, and animals are lifted into the air without any visibly physical means and float or fly about. The phenomenon has been said to occur in mediumship, shamanism, trances, mystical rapture, and demonic possession. Some cases of levitation appear to be spontaneous, while spiritual or magical adepts are said to be able to control it consciously. There seems to be several general characteristics about levitation. The duration of the phenomenon may last from a few minutes to hours. Generally it requires a great amount of concentration or being in a state of trance. Physical mediums that have been touched during levitation usually fall back to a surface. Levitations of saints usually are accompanied by a luminous glow around the body. Numerous incidents of levitation have been recorded in Christianity and Islam. Among the first was Simon Magus in the first century. Other incidents reported among the Roman Catholic saints include the incident of Joseph of Cupertino (1603-1663), the most famous, who is said to have often levitated through the air. It is reported he often gave a little shriek just before levitating, and on one occasion levitated for as long as two hours. Saint Teresa of Avila was another well known saint who reported levitating. She told of experiencing it during states of rapture. One eyewitness, Sister Anne of the Incarnation, said Saint Teresa levitated a foot and a half off the ground for about a half hour. Also Saint Teresa observed these levitations frightened her but there was nothing she could do to control them. She did not become unconscious, but saw herself being lifted up. And, at the beginning of the twentieth century Gemma Galgani, a Passionist nun, reported levitating during rapture. Incidents also have been reported in the religions of Hinduism and Buddhism. Milarepa, the great thirteenth century yogi of Tibet, is said to have possessed many occult powers such as the ability to walk, rest and sleep during levitating. Such feats were said to be duplicated by the Brahmins and fakirs of India. Similar abilities were reportedly shared by the Ninja of Japan. Throughout history the determining factor for judging whether the practice of levitation is caused by good or evil influence seems to depend on the one doing the levitating. Simon Magus was judged evil while Saint Teresa was said to do it in states of rapture. During the Middle Ages and Renaissance levitation was thought to be a manifestation of evil. It was said to be an unusual phenomena generated by witchcraft, fairies, ghosts, or demons. Even in present day levitation is often thought to be involved in cases of demonic possession. Many times beds, tables, chairs and other objects have been witnessed flying up into the air apparently by themselves. They frequently aimed themselves at the exorcist or his assistants. In 1906 Clara Germana Cele, a sixteen year-old school girl from South Africa, was said to be demonic possessed. She rose up five feet in the air, sometimes vertically and sometimes horizontally. When sprinkled with holy water she came out of these states of possession. This was taken as proof of demonic possession. Some physical mediums claimed to have experienced levitations. The most famous is Daniel Douglas Home, who reportedly did it over a forty-year period. 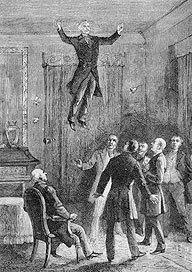 In 1868 he was witnessed levitating out of a third-story window, and he floated back into the building through another window. When levitating Home was not always in a trance, but conscious and later described his feelings during the experiences. Once he described 'an electrical fullness (sic)' sensation in his feet. His arms became rigid and were drawn over his head, as though he was grasping an unseen power which was lifting him. He also levitated furniture and other objects. The Catholic Church excommunicated Home as a sorcerer. Although he was never discovered to be a fraud like other mediums who used wires and other contraptions to levitate objects. Skeptics of levitation have come up with several theories as to its cause including hallucination, hypnosis, or fraud. These theories are not applicable to all incidents, however. The most likely and acceptable explanation is the Eastern theory of an existence of a force (simply, a universal force) which belongs to another, nonmaterial reality, and manifests itself in the material world. The technique of 'yogic flying' which consists of low hops while seated in the lotus meditating position has been achieved by advanced practitioners of Transcendental Meditation (TM). This has received worldwide publicity. The technique is claimed to be accomplished by maximizing coherence (orderliness) in brain-wave activity, which enables the brain to tap into the 'unified field' of cosmic energy. However, skeptic say yogic flying is accomplished through muscular action. A.G.H. St Joseph of Cupertino (Mystic, born 17 June, 1603; died at Osimo 18 September, 1663; feast, 18 September.) reportedly levitated high in the air, for extended periods of more than an hour, on many occasions. St Teresa of Avila (born in Avila, Spain, March 28, 1515.She died in Alba, October 4, 1582.) claimed to have levitated at a meta-height of about a foot and a half for an extended period somewhat less than an hour, in a state of mystical rapture. She called the experience a 'spiritual visitation'. Catherine of Siena (1347-1380), levitation in states of ecstasy. Hadewijch of Antwerp Flemish Catholic mystica (first half 13th century) is said to have levitated in state of trance. Saint Philip of Neri (Born at Florence, Italy, 22 July, 1515; died 27 May, 1595.) supposedly went up several yards during prayer, even to the ceiling on occasion. Ignatius Loyola (Born in 1491 at the castle of Loyola above Azpeitia in Guipuscoa, Spain; died at Rome, 31 July, 1556.) is said to have not only risen several feet but became luminous in the process. Saint Robert de Palentin allegedly levitated eighteen or twenty inches. Saint Dunstan (Probably his birth dates from about the earliest years of the tenth century.) supposedly rose off the ground a little bit just before his death. Saint Martín de Porres (December 9, 1579--November 3, 1639) To help Martin serve the poor and needy, God blessed him with miraculous powers of bilocation, of being able to pass through closed doors, and of levitation, according to Alban Butler's Lives of the Saints. Simon Magus reportedly had the ability to levitate, along with many other magical powers. As a dissenter from the orthodox Christianity of the time, this was branded as evil magic and attributed to demonic powers. Clara Germana Cele, a young South African girl, in 1906 reportedly levitated in a rigid position. The effect was apparently only reversed by the application of Holy water, leading to belief that it was caused by demonic possession. Magdalena de la Cruz (1487-1560), a Franciscan nun of Cordova,Spain. Girolamo Savonarola, sentenced to death,allegedly rose off the floor of his cell into midair and remained there for some time. Hindu Fakirs and Brahmans have a history of metaphysical levitation, which is active, rather than passive as in Christian mysticism. It is performed with the aid of a staff, though this does not have to touch the ground, and in a lotus position. 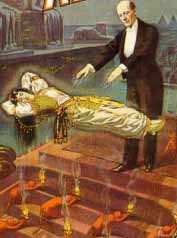 Many mediums have levitated during sèances, especially in the 19th century in Britain and America, however, almost all have been proved to be frauds using wires and stage magic tricks. Daniel Dunglas Home, the most prolific and well documented levitator of himself and other objects was said to repeatedly defy gravity over a career of forty years. He was reputedly observed levitating out of a building through a third story window and back into the building via a different window. He could also cause tables and chairs to raise feet into the air, and was never demonstrated to be a fraud by hundreds of purportedly skeptical witnesses and tests. He remained in full consciousness throughout these feats, and attributed them to the action of some kind of magical energy. Yogi Subbayah Pullavar, was reported to have levitated into the air for four minutes in front of a crowd of 150 witnesses, June 6th, 1936. He was seen suspended horizontally several feet above the ground, in a trance, lightly resting his hand on top of a cloth covered stick. Pullavar's arms and legs could not be bent from their locked position once on the ground. Yogi Milarepa was rumored to have possessed a range of additional abilities during levitation, such as the ability to walk, rest and sleep, however such were deemed as occult powers. Shirdi Sai Baba an Indian yogi is described in the Sri Sai Satcharitra to have mastered the art of levitation while sleeping. The only somewhat compelling and thorough case of controlled scientific tests performed recently were those of Nina Kulagina, a Russian 'psychokinetic', in the 1960s. She demonstrated the power to levitate small objects repeatedly in conditions which satisfied Russian, Czech, and American scientists, although she never levitated herself. She levitated objects such as table tennis balls, wine glasses, and matches in conditions engineered to make the use of hidden magnets, wires, and similar 'tricks' seem impossible. However, two things should be taken into consideration: first, these feats are commonly reproduced onstage by illusionists, and, second, scientists can be fooled by tricks of skillful magicians - as was proven by James Randi's Project Alpha in 1979. In fact, Kulagina's use of a stick was actually photographed by parapsychologists. But those parapsychologists did not wish to believe she was a fraud and called the appearance of the stick ectoplasma. The life of Saint Joseph of Cupertino door Christopher J Shorrock, Melbourne : A.C.T.S. Publications, 1985.